The Thames Bridges Charity ride in aid of the Stroke Association was always an interesting prospect. Over 35 miles and travelling over 16 bridges that span the river Thames instantly caught my interest all those months ago, to the extent I signed up for it. I also roped in my riding partner iCrazyBee who like me is always keen to do something different. We met at Charring Cross just after 08:00 and then made out way to the start point of the ride. We soon saw lots of other riders wearing the Thames Bridges Ride T-shirts so we followed them. Our first unofficial bridge of the day was Hungerford Bridge. The weather forecast said that it would rain today but the blue skies seemed to mock this and we were hopeful that it would stay dry. At the start lots of people participating in the event mingled or waited for friends, relatives or colleagues. It was a lovely atmosphere and there were lots of children riding with their mums/dads. Our first bridge was the famous Tower Bridge. Tower Bridge was built in 1894 with machinery to raise the central road span in 90 seconds. It was once a thriving port where cargo ships came from all over the world to unload their goods. On the north side of the bridge is the Tower of London, while further to the east is Docklands. The upper gangway is actually somewhere you can pay a visit to ( I haven't done so as yet but will one day) and at Christmas is often the home to parties. The view must be stunning. As we cycled in to the City the ever changing skyline gave me a few spots to return to as there were some rather interesting buildings. We past the Monument. This is marks the spot where the Great Fire of London started in 1666. It is a Doric column and the staircase of 311 steps up to the top really is something to see. Standing at 62m it was designed by Sir Christopher Wren and Robert Hooke. It really is worth. The top of The Monument had to be fenced in many years ago as it became a popular location for those wishing to commit suicide. Not too far from this as I came to a halt at a set of traffic lights, a fellow participant remarked that he thought I was doing well and able to go quite fast despite the fact I was on a Brompton. I said that as it was a charity event I would give him a head start. I did, overtook him and did not see him for the rest of the ride. London Bridge was built in 1973 (earlier bridges since the First Century were build near this site). The Romans built the first London Bridge, slightly downstream to the present one, and it was the only bridge across the Thames in London until Westminster Bridge was built. How times have changed. Southwark Bridge was built in 1921, although it replaced a much-avoided toll bridge. On the north side is The City and St Paul’s Cathedral, and to the south is Southwark Cathedral. Dickens grew up around the area and often wrote about it. Blackfriars Bridge was built in 1869 (earlier bridge 1769) and was named after a Dominican Priory at that site. Fleet Street and Inns of Court are near the bridge and it is also the meeting point for many a Halloween ghost walk. Waterloo Bridge was built in 1942 (earlier bridge 1817). The original bridge was elaborate with nine granite arches and pairs of columns at the piers. Two of the piers proved dangerous so the bridge was eventually demolished and replaced with the present one. Westminster Bridge was designed by Thomas Page and opened in 1862. With an overall length of 252 metres, it is a seven arch wrought iron bridge which has Gothic detailing by Charles Barry (the architect of the Palace of Westminster). This is one of my favourite bridges mainly because of the excellent views. Lambeth Palace is the official London residence of the Archbishop of Canterbury. The oldest remaining part of the palace dates from 1440 and it is amazing to think that it has been there for so long. Lambeth Bridge was used for the 2004 film Harry Potter and the Prisoner of Azkaban for a scene where the Knight Bus must pass between two Leyland Titans. Chelsea Bridge was built in 1937 (earlier bridge 1858). A suspension bridge close to Battersea Park and the New Covent Garden Market at Nine Elms. On the north side is the Chelsea Royal Hospital, and there is a community of houseboats lining the river on the Chelsea side. Albert Bridge was built as a toll bridge in 1873, it was commercially unsuccessful; six years after its opening it was taken into public ownership and the tolls were lifted. The tollbooths remained in place however, and are the only surviving examples of bridge tollbooths in London. Battersea Bridge was built in 1890 (earlier bridge 1772) and is a cast-iron bridge. When it was a wooden bridge it had a pier, and boats often collided with it. Wandsworth Bridge was built in 1940 (earlier bridge 1873) At the time of its opening it was painted in dull shades of blue as camouflage against air raids, a colour scheme it retains. Putney Bridge was built in 1886 (earlier bridge 1729) and links Fulham to Putney. It was originally a wooden bridge, but was eventually replaced by the present granite bridge. It is from here that the annual Oxford and Cambridge boat race starts. On our way to Chiswick Bridge I passed a Blue Plaque that stated Gustav Holst the famous composer of the equally famous 'The Planets' once lived in this riverside house. He certainly had a lovely view! Chiswick Bridge was built in 1933. At the time of its opening its 150-foot (46 m) central span was the longest concrete span over the Thames. The bridge is possibly best known today for its proximity to the end of The Championship Course, the stretch of the Thames used for the Boat Race and other rowing races. Kew Bridge was built in 1903 (earlier bridge 1759). Again, it was originally a wooden bridge and later replaced by a stone bridge. On the Surrey side of the bridge is Kew Gardens, the famous Botanical Gardens. Richmond Park - you will travel through this beautiful royal park which is home to 650 free-roaming deer! On our way to Kingston Bridge we travelled along a section of cycle path adjacent to the Thames. The views were stunning and lots of rowing eights were out on the water. I remember at university being almost press ganged into trying out for the rowing team as I was slightly over 6 feet tall. I did and was told in no uncertain terms that I couldn't row and believe me they were right! Kingston Bridge There has been a crossing at Kingston since Roman times and it is believed that the first bridge of timber construction was built in AD43 following the Roman invasion of England. Hampton Court Bridge was designed by the architect Lutyens to blend in with Hampton Court Palace. Five bridges have occupied the site so far, two of which are in place. Before the first bridge the site had a ferry dating at least to the 17th century. As we cycled along the Thames we eventually came to Hampton Court Palace. The Sir Christopher Wren designed South Front for William and Mary looked resplendent in the sun and the rain had held off. In the distance the Sir Christopher Wren designed South Front of Hampton Court. So intent was I in crossing the last bridge I actually missed the turn and headed off in to the distance. A few people on strange stilts were ignored by everyone? Perhaps people wanted to appear nonchalant about this unusual sight? 8 foot in my heels! The finished was a small park near Hampton Court station. We were cheered over the finish line and much to my delight I was handed a medal! Regular readers will of course know how much I like a medal. A rather good Aberdeen Angus beef burger and seasoned chips awaited me and my partner in crime iCrazyBee and I said very little to each other while eating - it was very good! I really enjoyed the Thames Bridges Ride. It was really well organised and there were arrows and a team of enthusiastic marshals on every single turn. Even I with my woeful navigation skills successfully negotiated every turn with their help and shouts of good luck. 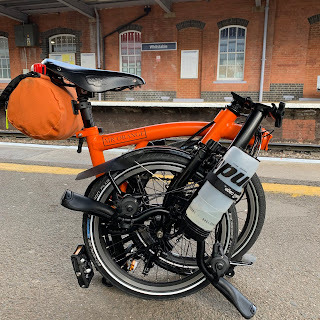 I recorded the ride on the Garmin 810 on loan from Garmin and I suspect it may become a ride the Brompton Club does in the future. The pace was not fast and I could have gone a great deal quicker but it wasn't really about that today. I wanted to photograph all the bridges and take in the views. I did that and more and yet again I am left with the feeling that London really is an incredible city to live in. My riding partner and I boarded the train for Waterloo and quite fittingly after cycling as far as Charring Cross we said our goodbyes. You can click on the link below to view the maps and ride data. It was a great route and if you want an interesting ride you might want to cycle a version of it. If not some of it could be walked or done via public transport. Very cool post, Mr. O.
I enjoyed learning about all those nice bridges and seeing the street scenes from your country.